Go ahead, turn the bag around and look at our ingredients. PureBites are made with only 1 ingredient; 100% Pure USA Sourced & Made Beef Liver. Dogs love the taste of PureBites because our treats are freeze dried RAW to lock in the aroma, texture and freshness they crave. Dog parents love PureBites because our treats are 100% pure and rich in nutrients for a happy and healthy life. Dogs love the taste of PureBites because our treats are freeze dried RAW to lock in the aroma, texture and freshness they crave. 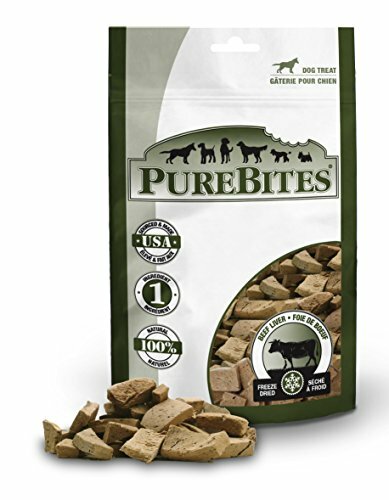 PureBites Beef Liver is proudly Sourced & Made in the USA and is high in protein with on average 5 calories per treat. Our products are ideal for dog with health issues or pets that are overweight, diabetic, have allergies, gastrointestinal disorders, or are on a restricted diet. Please scroll below and read From the Manufacturer for more exciting features. If you have any questions about this product by PureBites, contact us by completing and submitting the form below. If you are looking for a specif part number, please include it with your message.